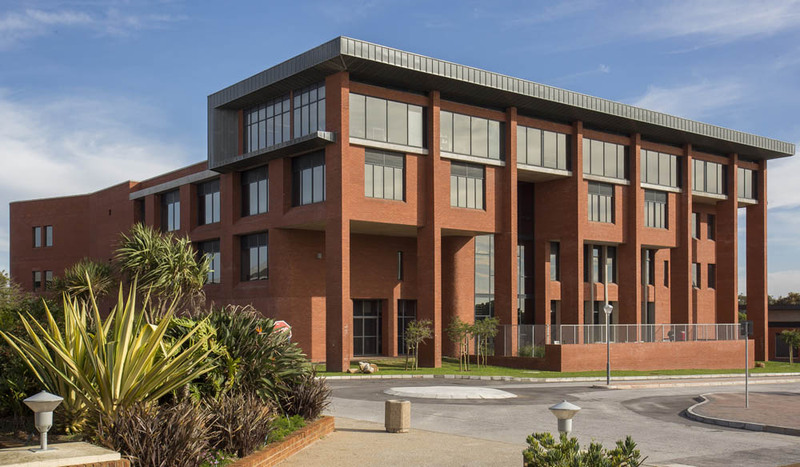 The Nelson Mandela University (NMU, previously NMMU) is a multi-campus institution with five campuses in Port Elizabeth and Uitenhage. 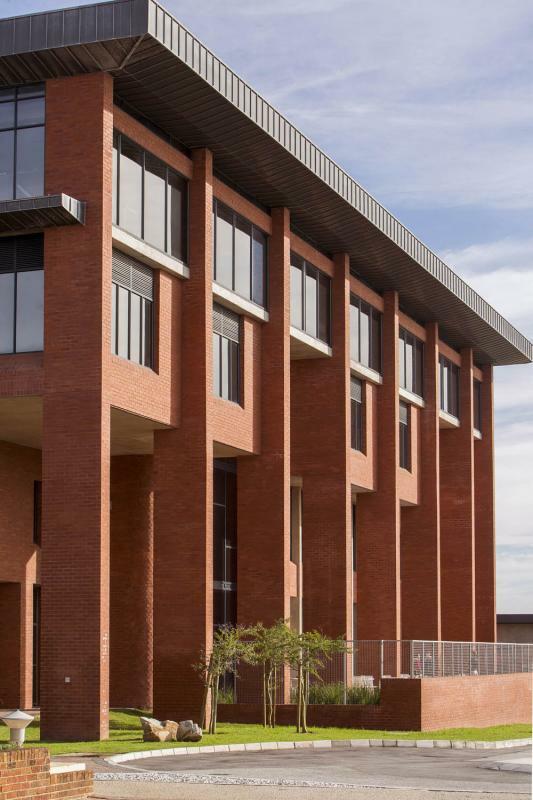 After a substantial redesign, the NMU Business School at the Second Avenue campus is a flagship for the university, with its numerous prestigious MBA and doctoral students. 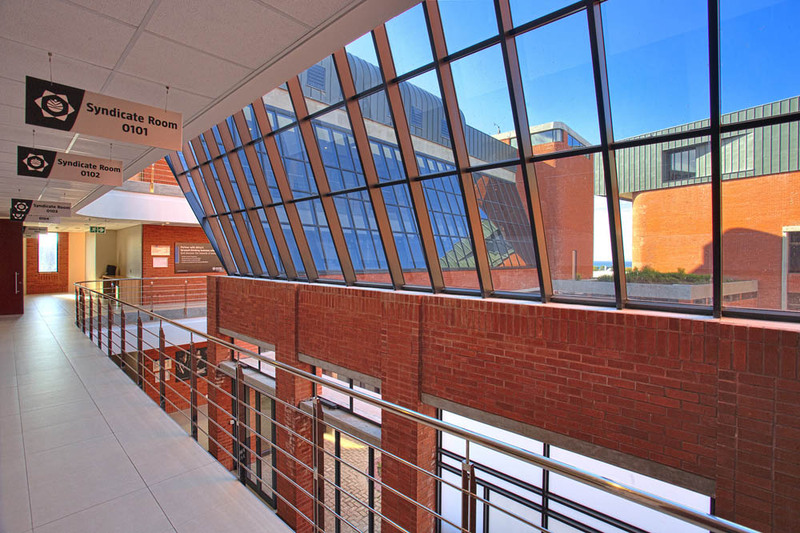 The Business School plays a significant role in the province – nurturing entrepreneurial spirit. The three-storey building is planned around a central open courtyard, and is located in the already degraded old parking lot facing the sports fields. The redesign has resulted in a powerful, self-contained and timeless base for the rapidly growing school. The building is minimalist with a concrete structure and richly-textured face-brick exterior. 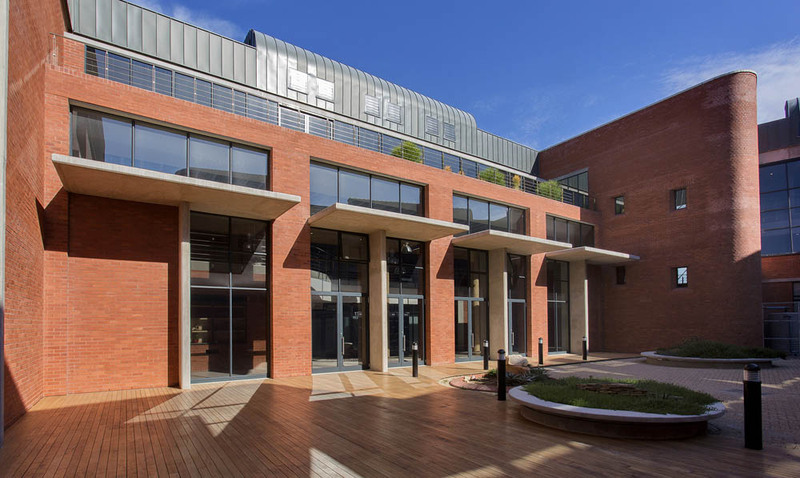 Its red face-brick exterior has a commanding presence that dominates the north-western campus. 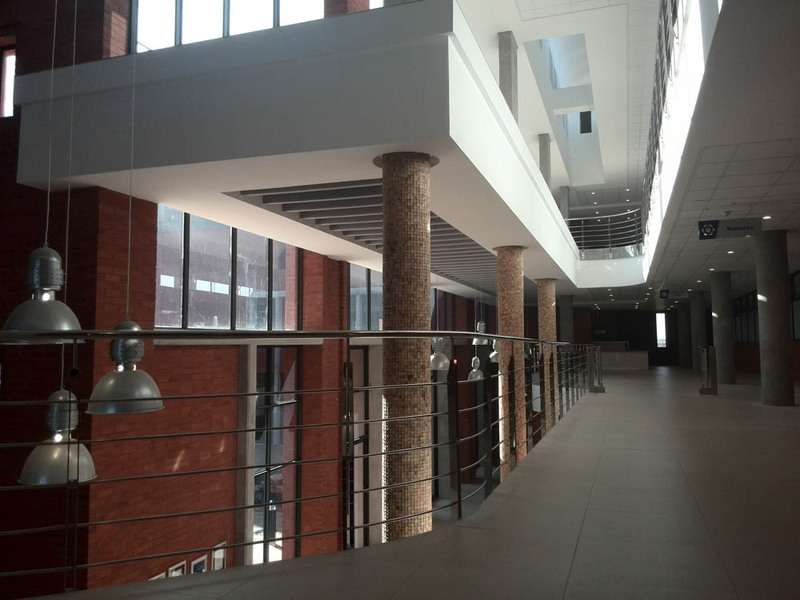 Facilities include three auditoria; lecture rooms, seminar and meeting rooms; a dedicated library; computer labs; public and private office space and a café restaurant with north-facing veranda. The main student pedestrian entrance to the campus on the north side, but the grand entrance is south-facing and leads off the revised parking area. An important consideration, built into the brief, was that the building should have a significantly reduced carbon footprint. It was ultimately awarded a four-star Green Building Council rating on the basis of the environmentally friendly design elements that were included. The pervasive face-brick skin and the carefully articulated forms limit heat gain and loss. The orientation, positioning and amount of glazing also do much to create a thermally benign interior. The basic materials were locally produced and available, reducing carbon generation through transportation at the construction stage. 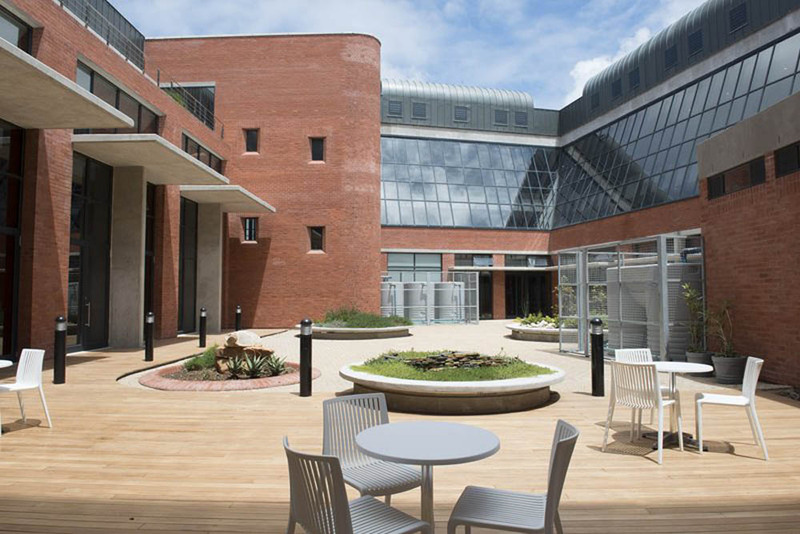 The courtyard makes natural light possible in the majority of the spaces. The north, west and south wings on the courtyard side are multi-volume areas improving natural ventilation. The “chimney stack effect” cools and ventilates areas opening on to the courtyard. 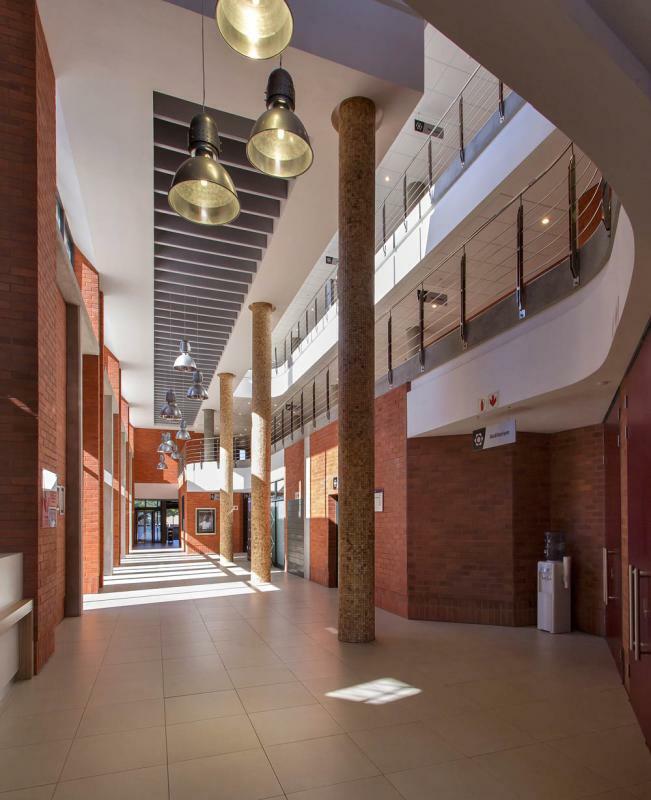 The use of natural clay face-brick which has high thermal mass to reduce temperature variations and provide thermal comfort without the need for heating or air-conditioning. All plants have low to medium irrigation requirement, or are xeriscape. 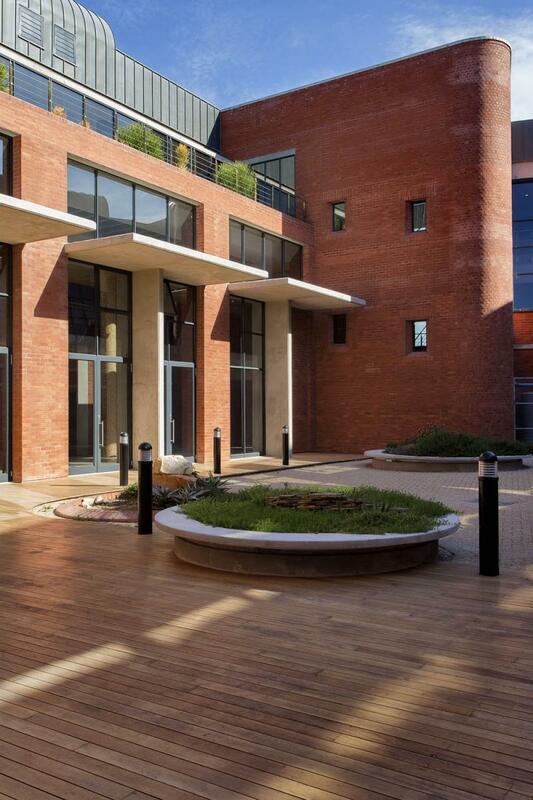 The 5 different planters in the courtyard each focus on a specific biome indigenous to the Port Elizabeth area. Occupancy sensors control the HVAC, which is shut off if no occupation is sensed after a given period of time. Energy efficient lighting is installed. Occupancy sensors control the lighting. The toilets and urinals are all supplied by the rain water tanks. Rain water is captured off 541m2 of roof area, and 30m3 of tanks are located in the courtyard. Extensive use has been made of smart glass, which limits thermal transparency. The combined effect of these measures reduces energy consumption within the building by 65%, while the C02-reducing measures increase budget by around 20%. The NMU estimates that due to reduced energy consumption and maintenance, they will recoup these costs within a few years. This significant project has succeeded in pushing the boundaries of ‘green’ design by means of a fairly large and sophisticated structure. A business school needs to express its status and exclusivity in the language of the architecture, but as an education institution must be a flexible functional space for large and small groups. The new campus enhances and enriches the campus, and gives the business school a strong identity as a serious and safe place of learning.